As the days passed after the November elections and vote tallies were finalized, it became clear that voters across the U.S. had turned out in record numbers for a midterm election cycle. It also became evident that Latino voters played a pivotal role in many races. Tom Perez, the first Latino to serve as chair of the Democratic National Committee, told an audience of about 175 people at the Japanese American National Museum in Los Angeles that his party’s get-out-the-vote effort targeted many populations that have been historically hard to motivate in large numbers, including Latinos. 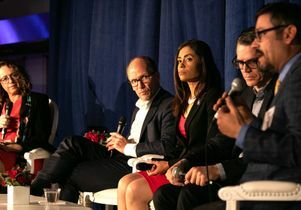 “The number of folks who turned out this year who were first-time voters was a remarkable phenomenon,” Perez said during the Nov. 14 panel co-hosted by UCLA Luskin-based Latino Policy & Politics Initiative and the Aspen Institute’s Latinos and Society Program. The panel conversation coincided with the release of a new report by the Latino Policy & Politics Initiative that analyzed 2018 midterm results in Arizona, California, Florida, Georgia, New Mexico and Texas — states with large Latino populations. The report found a significant increase in Latino ballots cast, said panelist Matt Barreto, faculty co-director of the initiative and professor of political science and Chicana/o Studies at UCLA.